A Beloit, Wisconsin native, two-way guard Tom Pratt became a symbol of grit other Hurricane players would emulate for years to come. 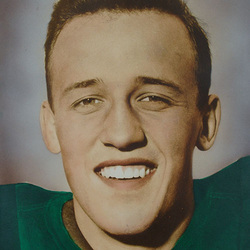 Pratt entered the University of Miami as a freshman in 1953 and found himself thrust into a starting role. As his career evolved, Pratt continued to start on both sides of the football, being counted on to play nearly 50 minutes a game. A four-year letterman, Pratt never stopped improving. During his first campaign Pratt was considered to be a solid blocker and tackler. By his senior year, he found himself to be one of the most respected players on the squad. He was then a supreme blocker and wound up leading the sixth ranked 1956 Hurricanes in tackles with 46. (the number six ranking by AP and UPI that year was Miami's highest ever finish to date in a post-season poll.) During his junior year he captured the national collegiate heavyweight wrestling crown. Upon graduation, Pratt accepted a coaching job with the Hurricanes. In 1963, he moved to the professional ranks as a defensive coach with the Kansas City Chiefs. He also had stints with the New Orleans Saints and the Cleveland Browns. Pratt is now back with the Chiefs as the defensive line coach. NOTE:Tom Pratt continued to coach in the NFL through the 2017 season and is now retired near Tampa.